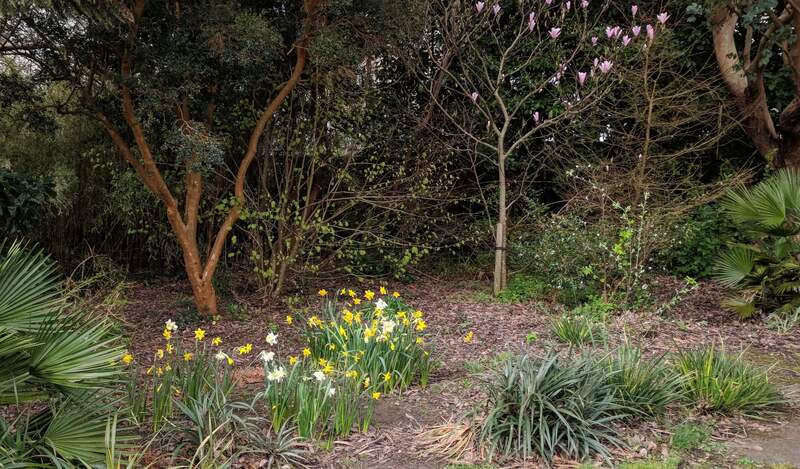 Daffodils have long been an important part of the Cornish landscape and Cornish gardens. They thrive and flower early in the mild climate of the south Cornwall coast, and during the nineteenth century many farmers turned to growing flowers, particularly daffodils, often in tiny fields on the clifftops. The trade had a boost when the direct railway line reached Penzance in 1859, and Cornish growers were able to send cut flowers to the London markets, as well as supplying bulbs for gardeners all over the country. We are grateful for the support of some of our local bulb producers, who have provided daffodil bulbs for us to enhance the spring display in the Gardens. Is Morrab one of your favourite spots in Penzance? Help other people to get the most out of their visit – review us and describe what you like best about Morrab Gardens! The Moran Gardens are situated in Penzance and an easy walk from the the main town car park or central Penzance. We always enjoy visiting when on holiday in Cornwall. The gardens are several acres in size and consist of mainly very mature Tropical trees , plants and shrubs. There are plenty of seats and overall a very pleasent way to spend a couple of hours although there are no other amenities within the gardens. Free admission is also a bonus. Keep up with the news from Morrab Gardens. Enter your email address to receive notifications of new posts by email. Yes please, keep me updated!